WhatsApp is expected to activate the feature in the coming weeks. The feature will allow users to revoke their messages before the recipient reads it. 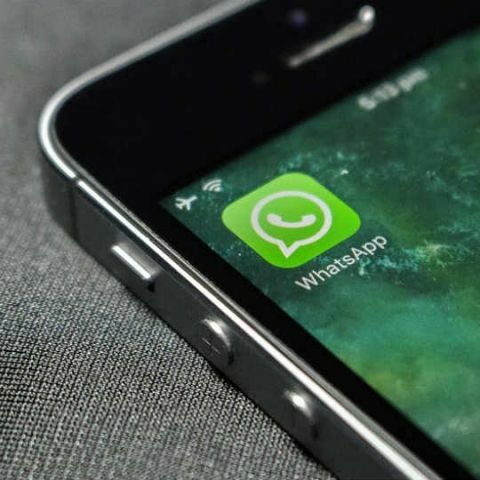 WhatsApp's much-rumoured message recall feature might debut as 'Delete for Everyone' and the social messaging platform has reportedly activated the feature. According to WABetaInfo, which spotted the feature, WhatsApp users can now recall their messages before the recipient reads them. 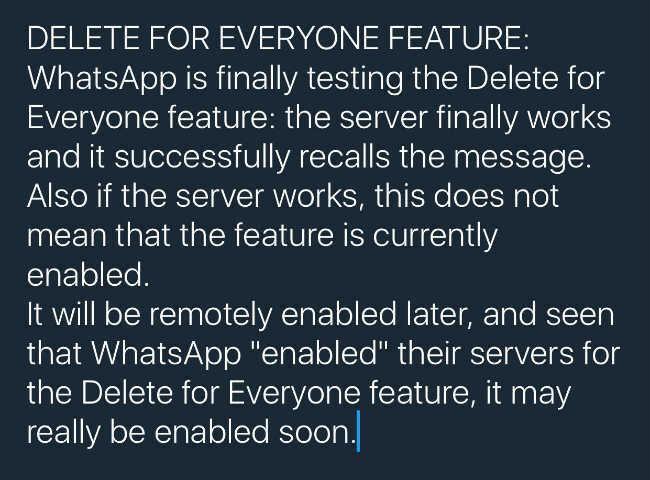 WhatsApp has enabled its server for this feature and it will be remotely enabled for everyone later. WhatsApp has been testing this feature for a long time now and it was rumoured to debut first on iOS and make its way to Android and Windows later. The feature was mostly seen in the code of WhatsApp beta and was not available for testing. With the Facebook-owned company activating its servers, the launch of the recall feature seems imminent. WABetaInfo says that the feature will arrive on both Android and iOS and will delete messages from the notification centre as well. The feature was also spotted in beta version 2.17.218 of the Windows Phone app recently. The feature is expected to work similar to Gmail's "Undo Send" feature, giving WhatsApp users a fraction of seconds to recall their message. WhatsApp, however, won't be the first to bring that feature to the mainstream. WhatsApp rivals Telegram, Viber and others already offer a similar feature. WhatsApp is said to allow users to even edit their message in case they don't want to revoke the message. WhatsApp has been on the forefront when it comes to enabling new features on its platform. The messaging app with over 1.2 billion monthly active users has successfully incorporated Snapchat-style Status feature and is now exploring ways to monetise its service by letting businesses contact its users. With the revoke feature, WhatsApp might add ease of communication to its platform and the feature can truly reach a large number of audiences.